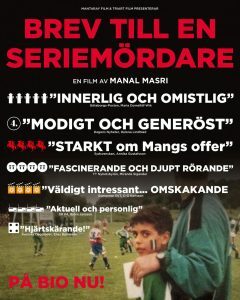 One of the highest attended Swedish films of 2017 has been Manal Masris’ documentary Letter to a serial killer. The film has been praised by both audiences and reviewers and in 2018 it was nominated for a Guldbagge (Sweden’s equivalent to the Oscars) in the best documentary class. “Magnus Jarlbo’s music always hits the right feeling” wrote Annika Gustafsson in her review in Sydsvenska Dagbladet March 24, 2017. “Intimate and essential” wrote the Gothenburg Post, “Heartbreaking” wrote the Svenska Dagbladet.